This is the sort of thing, I suppose, that has turned the health care debate into the smoldering sludge that is left over when a pile of immolated facts are mixed over and over again with thick, sticky rhetoric. 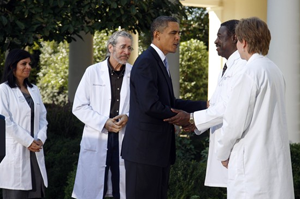 Are we really expected to believe that these four doctors, who, between them represent about every minority group you could possibly enumerate in four bodies, just happened to wander over from the hospital in their (spotless) white coats to smile at the President's health care reform plans? Everything about this debate has become so staged, such poorly painted stage construction, an illusion from both sides, that it is difficult not to be insulted at every turn. Are we supposed to just cave in here like comforted children? "Oh, look, white coats! He's talking to real doctors. It will all be fine."